Asian markets mostly fell Monday after Donald Trump’s top economics adviser took the wind out of their sails by downplaying the chances of a quick deal to end the China-US trade war. The US leader fuelled a blistering rally in the region Friday by tweeting that he had held positive talks with Chinese President Xi Jinping, before a report said he had even asked officials to draw up a draft bill with an eye on a potential agreement. But White House adviser Larry Kudlow later tempered expectations, telling CNBC “there’s no massive movement to deal with trade”. The news sent US markets into the red, snapping a three-day rally on Wall Street, and sending Asian investors rushing for the door. “Investors are far too wary of an empty promise,” said Stephen Innes, head of Asia-Pacific trade at OANDA. Hong Kong — which climbed more than four percent Friday in its best day for almost seven years — sank almost two percent, while Shanghai fell 0.4 percent. Dealers are keeping tabs on a massive import expo in Shanghai that Xi opened Monday by telling delegates China would increase efforts to open up its economy. He said authorities would “step up” moves to stimulate domestic consumption of imports, lower tariffs, ease customs clearance procedures, and implement harsh punishments for intellectual property infringements, a key cause of Washington’s anger with Beijing. Tokyo went into the break 1.2 percent lower, Singapore dropped 1.4 percent and Seoul was 1.6 percent off. Wellington and Taipei were also deep in negative territory. However, Sydney edged up 0.1 percent and Manila gained 1.3 percent. 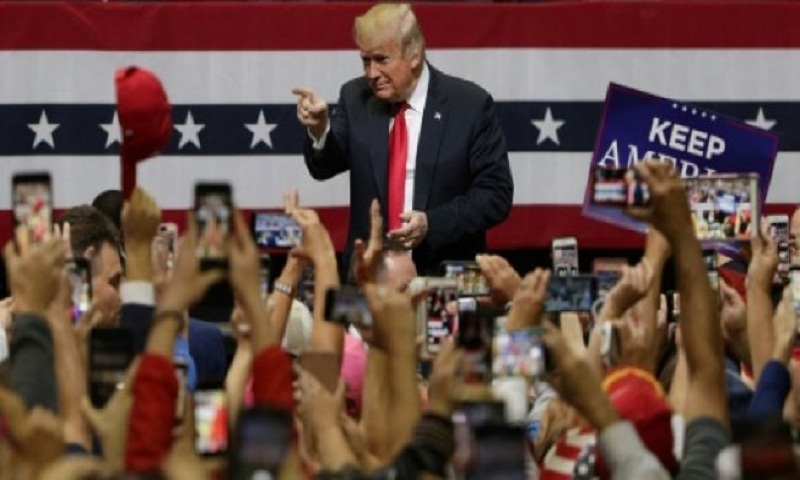 Traders are now keeping an eye on the US mid-term elections Tuesday, which are seen as a vote on Trump’s performance since taking the White House, with the Democrats looking to take control of the House of Representatives. A win for them could also raise the chances of Trump being impeached, fuelling uncertainty. “The mid-term elections carry a considerable amount of political and market risk not to mention legal risk for the current administration so that the markets could swivel higher or lower on the outcome of this election,” Innes added. On currency markets the dollar was holding up against the yen after Friday’s jobs data showed another blockbuster number of new positions created and the biggest jump in wages for nine years. The data solidified expectations the Federal Reserve will press on with its interest rate hikes next month and into 2019. However, the greenback was lower against the pound after a report in the Sunday Times in Britain said Prime Minister Theresa May had clinched a Brexit deal with the European Union. Oil prices slipped as the US prepares to reimpose sanctions on Iran but with a number of countries including India, Japan and possibly China being given waivers to continue buying from the country. Adding to the downward pressure are expectations that major producers Saudi Arabia and Russia will ramp up their own exports to make up for the shortfall from Iran.